The United States Congress designated the Bull of the Woods Wilderness (map) in 1984 and it now has a total of 36,878 acres. All of this wilderness is located in Oregon and is managed by the Forest Service. 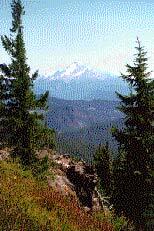 The Bull of the Woods Wilderness is bordered by the Opal Creek Wilderness to the west. This isolated Wilderness boasts about a dozen lakes measuring at least one acre and chock-full of trout. These blue jewels are nestled throughout the mountains, accessible by trail but separated by high ridges. The mountain slopes are quite steep, with lower inclines ranging from 30 to 60 degrees and upper inclines from 60 to 90 degrees. Numerous streams cut through the peaks, including the major headwaters of the Collawash, Breitenbush, and Little North Santiam Rivers. The vegetation varies according to the elevation, from sparse subalpine forestland that extends to 5,700 feet to dense old-growth Douglas fir and western hemlock, one of the last stands of old growth in western Oregon. The northern spotted owl shares these lofty branches with at least five other species of owls. Chances are slim that you'll ever encounter one of these nocturnal creatures; you're much more likely to see deserted mine shafts and old equipment, relics of past mining activity. Not far west lies Table Rock Wilderness. At 5,523 feet, Bull of the Woods Peak marks the hub of a relatively challenging 68-mile trail system, with several loop opportunities for overnight or long weekend hikes. An old lookout at the summit still commands an astounding view of the surrounding area. The Pansy Lake Trail to the lookout tower travels about 1.2 easy miles to pretty-as-a-flower Pansy Lake before starting to climb. The Hot Springs Trail leads about 1.5 miles to Bagby Hot Springs, where you can melt into one of the steamy soaking tubs. Rangers don't allow camping here, so after your soak you can pick up the same trail and head more than 13 miles across the middle of the Wilderness. Twin Lakes and Elk Lake are the most popular, and show the impact of poor camping habits. Planning to Visit the Bull of the Woods Wilderness? How to follow the seven standard Leave No Trace principles differs in different parts of the country (desert vs. Rocky Mountains). Click on any of the principles listed below to learn more about how they apply in the Bull of the Woods Wilderness.